Mirza Ali continues to explain to me that he hardly ever sees any travelers from his own country visiting his village and the magnificent surrounding areas. He wants to change this – create something unique – especially for young woman. Enter Pakistan Youth Outreach. I ask Mirza why the focus on educating young women?? “I started this program with my sister Samina in 2010. She has chosen mountaineering and mountain guiding as her future career, and will be the first female in Pakistan to do so. She is also the first Pakistani woman to climb over 6,400m. Samina is currently still in college but in the very near future, she wants to be a tour leader, guide women groups in the Karakoram, and assist with our Pakistan Youth Outreach programs and charity work." Mirza and Samina organized their first expedition in 2010 to Chashkin Sar in Shimsal, to create awareness among youth and empower women in adventure sports. 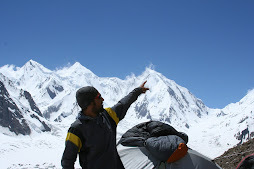 Samina successfully summited the 6,400m peak (now called Samina peak! ), and the documentary was picked up by leading TV channels in Pakistan. The brother sister duo grew up in the mountains of Karakoram Hunza-Shimshal. The village, Shimsal, is located on the Pakistan-China border at 3,300m above sea level and considered among the world’s 15 highest settlements. According to Mirza, Shimshal is one of the most remote and isolated villages in Pakistan, and very hard to access for the modern world. Find out more about Mirza and Samina's inspiring work and remarkable leadership atwww.pakyouthreach.com.